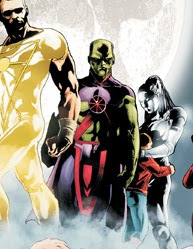 When Frank, alias "FLD," ("Fun-Loving Doofus," "Furiously Livid Dog," or "Frank Lee Delano," he's left the door open and there's no turning back now) over at the Idol-Head of Diabolu, mentioned in a post that J'onn was wearing purple, I kind of thought it was just a lighting issue. Turns out I was wrong. He IS wearing purple. As both a purple lover and a comics purist, my emotions are torn. Do I go with the color I love so dearly, my favorite color, the color that comprises 80% of my wardrobe?! Or do I go with a pulishing history that reaches back from sixty years, and a costume that, even though it's seen its share of re-designs, still comes back to its basic form published fify-five, nay, fifty-six years ago? Purple and green are complimentary colors, but it's too fab and conspicuous for J'Onn J'Onzz. The cut and color are massively derivative of Drax the Destroyer. I'll have to run a "knock-offs" on him if I haven't already. I am a Blogger of Many Aliases, but for the record, the initials are to help me temporarily partition my comics stuff from a school related project I'm also running through Blogspot. Purple? Oh this isn't good. Only VILLAINS use purple and red! Or purple and green. Or just purple. Well...maybe a few heroes use purple, but not too many. Oh J'onn come back to the Justice League where you belong.